The English Bulldog (or simply ‘Bulldog’) was bred in England in the 1500’s for bull baiting, a popular gambling ‘sport’ in which one or more dogs were matched up against a chained bull (or bear). These dogs were bred for sheer fighting capacity, and they were famed for latching onto their prey with an iron jaw which they refused to release—they could even suffocate opponents this way. English Bulldogs fell in popularity when bull baiting was outlawed in the 1830’s, but a committed group of devotees kept the breed alive and selected away any trace of ferocity. Easily recognizable by their distinctive and adorable ‘sourmug’, English Bulldogs serve as the mascots of dozens of sports teams, most famously Georgetown University. 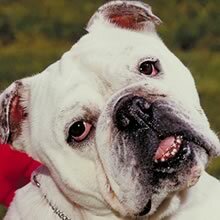 Other famous English Bulldogs include Handsome Dan, the Yale mascot, and Tyson, the skateboarding Bulldog of internet fame. English Bulldogs are simultaneously a symbol of British tenacity and an immensely popular American pet. The English Bulldog has a shoulder height of 31-36 cm (12-14 in) and weighs 22-25 kg (48-55 lbs). It is known for its short, wide muzzle, undershot jaw, and wide, droopy face giving the appearance of a frown. English Bulldogs have short legs and tails, rounded chests, and compact, muscular bodies. The English Bulldog has a short, smooth, glossy coat which can be beige, mottled, brindle, or white. The English Bulldog is affectionate, uncomplicated, gentle, intelligent, sensitive, and fearless. It is known for its loyalty; its happy-go-lucky attitude is in sharp contrast to its sour face. English Bulldogs are happiest by their owner’s side and will misbehave if ignored. English Bulldogs are active, alert, and playful, but not unduly boisterous. The English Bulldog is affectionate, uncomplicated, gentle, intelligent, sensitive, and fearless. It is known for its loyalty; its happy-go-lucky attitude is in sharp contrast to its sour face. English Bulldogs are happiest by their owner’s side and will misbehave if ignored. English Bulldogs are active, alert, and playful, but not unduly boisterous. English Bulldogs enjoy mixing with other dogs and household pets. They are great with children, well behaved, adaptable, comfortable companions with an affectionate nature and even disposition. Some English Bulldogs are cautious with strangers, but most are friendly to everyone. They are likely to drool or snore. You can find English Bull Dog puppies priced from $200 USD to $35000 USD with one of our credible breeders. Browse through our breeder's listings and find your perfect puppy at the perfect price. English Bulldogs enjoy mixing with other dogs and household pets. They are great with children, well behaved, adaptable, comfortable companions with an affectionate nature and even disposition. Some English Bulldogs are cautious with strangers, but most are friendly to everyone. They are likely to drool or snore. When the English Bulldog is shedding, use a rubber brush to remove dead hairs. A special lotion will occasionally need to be applied to the facial and tail folds to keep them clean; soft tooth brushing with an approved toothpaste is also recommended. The English Bulldog has a lifespan of 8-12 years. Due to its facial features, it is susceptible to breathing problems and skin infections, and many are delivered via Caesarean section due to their large heads. Most English Bulldogs cannot swim and are averse to hot weather. Consistency is important, but the English Bulldog is highly sensitive to the tone of its handler's voice, making training a fairly simple process. It is inquisitive and quick to learn simple tasks, yet unpredictable as it is a bit stubborn on occasion. The exercise needs of the English Bulldog are uncomplicated. It will adapt itself to the activity level of your family. Sufficient rest is key to development of healthy bones, muscles, and joints—do not expect your English Bulldog to run long distances or jump down from tall ledges. English Bulldogs are well suited to apartment life. English Bull Dog Puppies for Sale - Shipped Worldwide! Finding the right English Bull Dog puppy can be dog gone hard work. PuppyFind® provides a convenient and efficient means of selecting and purchasing the perfect English Bull Dog puppy (or English Bull Dog puppies) from the comfort of your home, 24 hours a day, 7 days a week. Take advantage of our PuppySearch or leisurely browse our directory of hundreds of dog breeds, English Bull Dog dog breeders, English Bull Dog dogs for adoption, and English Bull Dog puppy for sale listings with photos and detailed descriptions. Some English Bull Dog puppies for sale may be shipped Worldwide and include crate and veterinarian checkup. Many English Bull Dog dog breeders with puppies for sale also offer a health guarantee. With thousands of English Bull Dog puppies for sale and hundreds of English Bull Dog dog breeders, you're sure to find the perfect English Bull Dog puppy.